ShareChat is a social network for the next billion smartphone users. They have grown organically to 18 million active users and are doubling every 4 months. Currently, their userbase is majorly from India, Sri Lanka, Bangladesh, Nepal, Kuwait, Qatar, UAE, Canada and are expanding at a very rapid pace. We are happy to associate with ShareChat and would like to announce that they are the official sponsors for the January Lunchtime 2019. Through this contest, they are also providing full-time opportunities with lucrative offers. Interested programmers can go through the above mentioned application link. 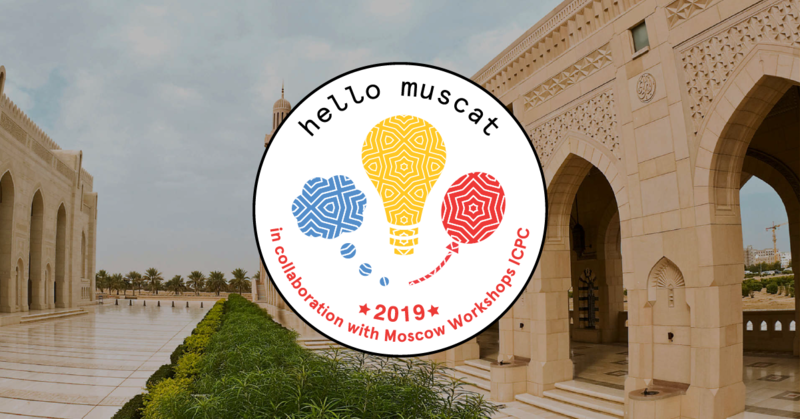 Moscow Workshops ICPC and Harbour.Space are collaborating to organize the Hello Muscat Programming Bootcamp, hosted by the German University of Technology, in Muscat, Oman! The objective of the camp is to provide advanced level training to the students who are preparing for the ICPC World Finals and to the ones who are extremely passionate about Competitive Programming by the best coaches in ICPC history. Top 3 Division 1 winners of the January Lunchtime who are also eligible for ICPC 2019/2020 season will get free entry to the Hello Moscow Programming Bootcamp. For more details about the Bootcamp, visit Hello Moscow Programming Bootcamp's officical page. With CodeChef laddus, the winners can claim cool CodeChef goodies. Know more here: goodies.codechef.com. In addition to it an appreciation certificate will also be provided to the winners. 27th Jan 23:00 IST: The January Lunchtime 2019 has ended! The editorials can be found here. MOSS results are not out yet. Ranklist will be recalculated and Laddus will be provided post the MOSS process. *Top 3 Division 1 winners of the January Lunchtime who are also eligible for ICPC 2019/2020 season will get free entry to the Hello Moscow Programming Bootcamp. For more details about the Bootcamp, visit Hello Moscow Programming Bootcamp's officical page.